Type: Small orange/ red predatory mite, has been used for over 45 years. 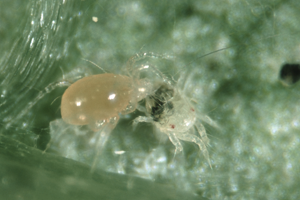 How it works: Predator actively hunts and attacks all stages of mites. Species controlled: Tetranychus spp. (two spotted spider mite). Can be used on protected edible and ornamental crops as well as outdoor soft fruit. Cannot establish in the absence of spider mites (Tetranychus spp.) and performs best in warm, relatively humid conditions but may fail in hot, dry conditions. 5 to 10 mites per m2. Some low humidity crops or indoor atria may require twice this rate. Works well on Leeks and Onions grown under cover , always apply early in the season before the infestation gets too large.